Earlier this month I decided on a whim to make a return visit to Saint Matthew's Fair in Prague, some nine years and change since my last visit. Photographs posted online by a fellow enthusiast had revealed the presence of three family coasters that were new to me, and though none were significant they nevertheless gave me all the excuse I needed to return to a city I'd not been to since the choir I'm involved with sang there at a festival in late 2013. If you'll forgive a quick plug, the group in question has three different recordings available on the iTunes Music Store (and competing platforms) and would very much welcome your support! 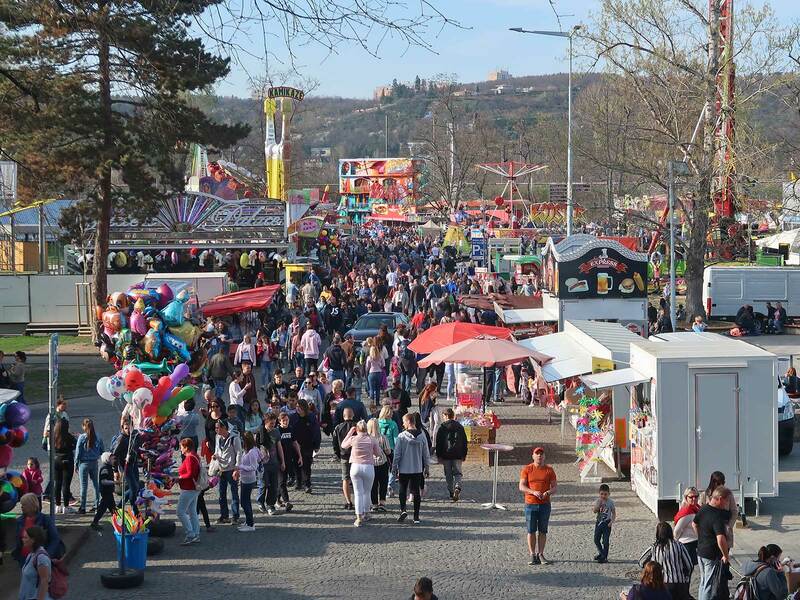 The fair takes place at the Prague Exhibition Grounds, a few minutes walk from the Nádra&zcaron;í Holešovice metro station, or for preference about three kilometres from Old Town Square. There is a 30 CZK (~€1.16) admission charge on weekends that is presumably designed to encourage those with the option to do so to visit on a weekday instead. I purchased my ticket online ahead of time for a 5 CZK (~€0.19) surcharge with the assistance of Google Translate, and I'd strongly recommend readers do the same; there was a queue of at least fifty people waiting to buy onsite that looked to be barely moving. The security guard glanced at the printout I handed him, tore it down the middle, and handed it back to me to dispose of; there was nothing to stop an unscrupulous visitor printing and using multiple copies of the same ticket. The entrance took me past a number of children's rides and a pyramid-shaped concert hall bedecked with posters advertising Fantom Opery, an adaptation of the famous Andrew Lloyd Webber musical localised into Czech by Jaroslav Machek. It was tempting to try to snag a last minute ticket despite the language barrier, but a quick check of my phone revealed that the day's performance had already sold out. Those with more than a passing interest in such things might enjoy a video showing rehearsal clips on YouTube; I have to say that that the Phantom does look somewhat less dignified wearing shorts and a luminous green polo shirt. In due course I arrived in front of Jungle (Dykovsky) (#2585), one of twelve known examples of an EOS Rides Crazy Twister. This particular machine began its career on the French fair circuit under the ownership of Eddy Leraitre, before being exported to Poland at some point in the late noughties. Between 2009 and 2014 it was based at Rabkoland, though it was taken out of the park from time to time for major events, causing me to miss it in July 2010. Today the ride was operating a five lap programme for 80 CZK (~€3.10). I decided to take a back seat, which in hindsight was a tactical error; though my car spun well the tracking was on the far side of brutal, to the point that I found myself wondering whether the wheels had been deliberately sharpened. Once was more than enough. My second hit was Amazing Drive (Spielka), a double helix Yamasakutalab machine that was my first example of the type back in 2010. The train was surprisingly narrow, and though I did see a few people sitting in pairs that option was really only practical for children. The 60 CZK (~€2.33) programme started with a half lap in reverse, followed by five forward laps that were quite sluggish in comparison to the equivalent machines elsewhere; I rather suspect that the top speed was being deliberately moderated in order to save on maintenance costs. Horská Draha (Helfer) (#2586) was similarly flaccid, though it was a more comfortable ride thanks to a wider train. Against all expectation the best new credit of the day turned out to be Horská Draha (Jan Novy) (#2587), a variant of the common Wacky Worm with an unbraced rail design that looks very different to other versions of this design. 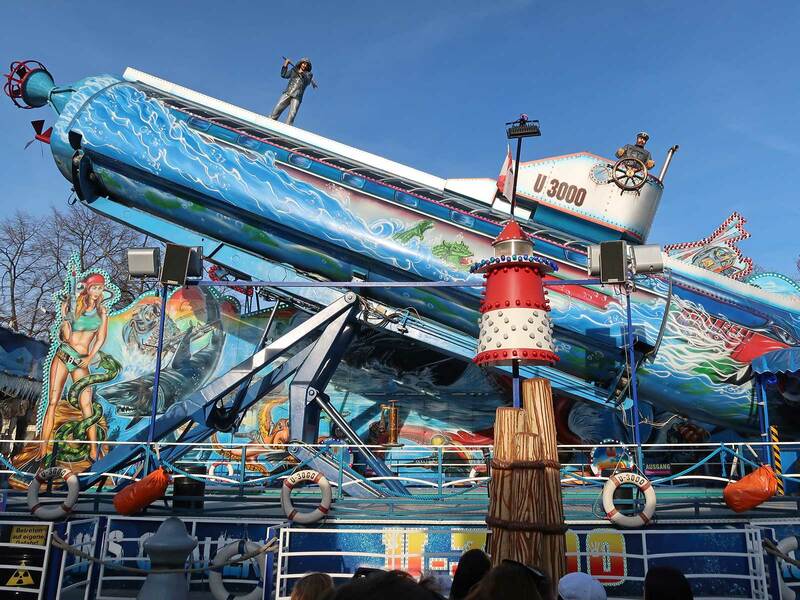 There is a slight descent on the upper level in place of the usual gentle bumps, and no trim brake on the drop, resulting in a pleasingly forceful final turn. The train has a detailed figurehead of a dog with big ears on the front car that looks much better than the typical squashed caterpillar. The programme in use today was sufficiently long that I lost count of the number of laps, making the 60 CZK (~€2.33) ticket remarkably good value. One of the most interesting features of the fair from the perspective of a visitor is the foreign corner, which features a number of machines brought in from Germany and the Netherlands. Pride of place today was taken by Gold Mine Tower (Ordelman), an eighty metre drop tower with seats that tilt during the ascent, though they reset to level prior to the drop. Next to it was Super Mouse (De Voer), a standard Reverchon model that I rode out of courtesy for 120 CZK (~€4.65). Other key attractions included Ghost Rider (Löffelhardt), Best XXL (Zinecker), U-3000 (Kleußer), and Snow Jet (vd Veen),. I spent a pleasant half hour soaking up some of the atmosphere before walking across town for some traditional Czech cuisine.